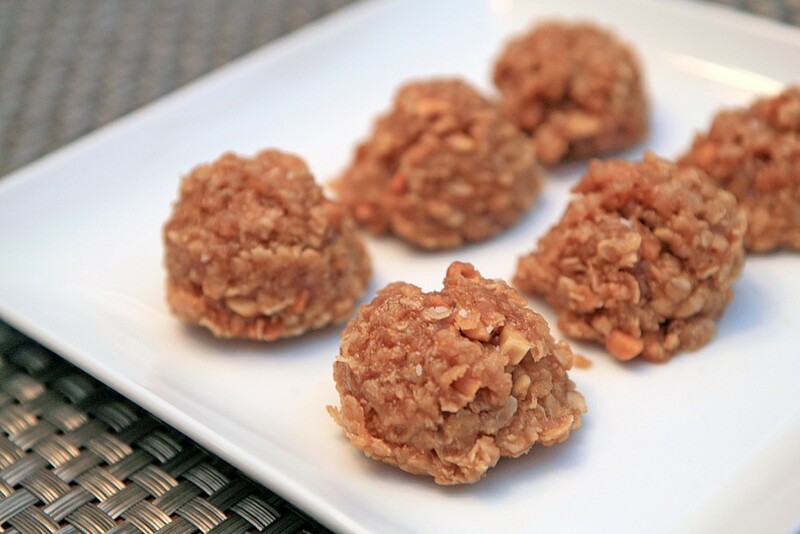 These loveable bites are simply amazing and oh-so-easy to make. With just a few steps, 5 ingredients and no bake time, you’ll be enjoying a sweet delight in no time. These little loves are perfect for autumn picnics, football parties or wine tasting with the ladies. Enjoy! Using the method of a double boiler, melt peanut butter– place water in a small sauce pot and bring to a bowl. Find a metal or glass bowl that fits over top the pot. As the steam rises from the boiling water, it will melt the peanut butter. Once the peanut butter is creamy, add sugar. Stir to combine and allow the heat to melt the sugar into the peanut butter. Remove from heat and add in agave, a pinch of salt and vanilla. Stir to combine. Gently fold in oats. Use a small cookie scoop to transfer to a baking sheet lined with wax paper. Chill for 30-1 hour to set.